To fly on those journeys, astronauts might have to someday harvest fuel from the surface of the moon or Mars — likely in the form of cryogenic fluids like hydrogen, oxygen or methane with a very low boiling point. A new robotic refueling mission traveling in the Dragon's unpressurized trunk, called Robotic Refueling Mission-3, will practice transferring and storing liquid methane in space for the first time. "If your goal is to drive across country, you're not going to get there on just a tank of gas," Hsiao Smith, deputy director of the Satellite Servicing Projects Division at NASA's Goddard Space Flight Center, said during the conference. "Spacecraft today are limited to the fuel they carry on board. In order to further space exploration, refueling spacecraft is a necessity." At some point after the Dragon spacecraft reaches the space station and is berthed to its side, the station's 11-foot robotic arm will unload the module and use a suite of three tools to connect a tank full of liquid methane to an empty tank and transfer 42 liters of fluid fluid while monitoring the process. After that, the new tank will store the methane for six months without any material boiling off. "The robotic tools and vision system demonstrated by [the mission] for refueling missions could also be used for satellites in commerce, navigation or science, benefiting us right here on Earth," Hsiao said. "Not bad for a module that is the size of a washing machine." Question: How will the new tank store liquid methane for six months without any material boiling off? Will it be carefully shaded from the Sun, Earth, and other sources of blackbody radiation, or will it a routine dose of sunshine that most things outside the ISS receive over the course of an orbit or a year? How will it use radiation to Space to cool itself? So far I've only found this which doesn't really explain how this is done. Storing cryogens in space can be difficult because their extremely low boiling points, cause them to boil off over time. The boil off can lead to the formation of one or more large bubbles that increase the pressure in the tank. The bubbles don’t rise to the top like they do on Earth, because of microgravity. If a large bubble settles at the opening to the transfer line, it could interrupt the flow of liquid. Therefore, a critical part of RRM3 is storing 42 liters of liquid methane for six months with zero boil off, demonstrating methods to more efficiently use cryogens. By using cryocoolers and advanced multilayer insulation to balance temperatures, fluid loss can be dramatically lowered, eliminating the need for oversized tanks and extra propellant. 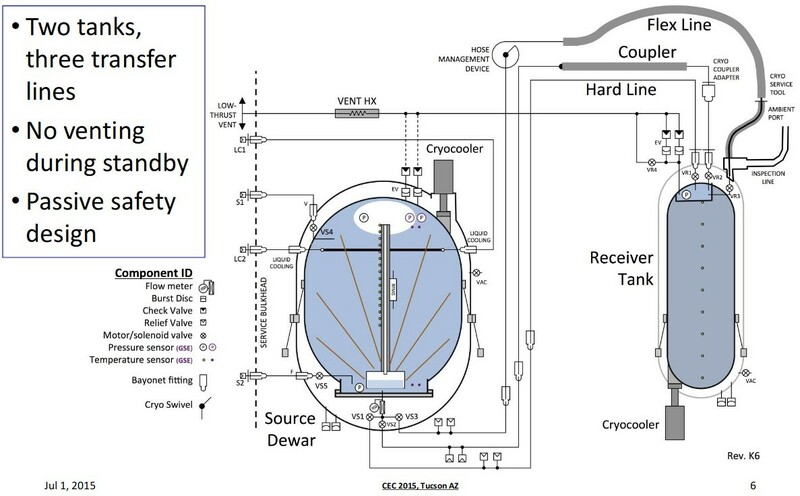 To demonstrate methods to store, transfer and freeze standard cryogenic fluid in a zero-gravity environment through the use of innovative component designs and techniques for both conventional and cooperative interfaces. 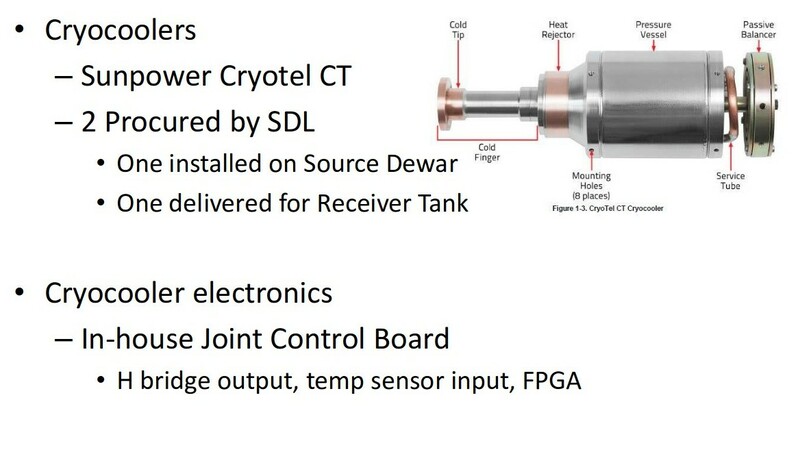 To verify robotic manipulation and actuation techniques necessary for cryogenic fluid transfer. The use of Xenon gas is a puzzler though. Lift is a cryocooler's ability to remove heat from the cold tip while maintaining the stated temperature. The coolers use "free-piston Stirling technology". The Wikipedia cryocooler article has information about how Stirling cryocoolers work; this may or may not be applicable to these devices. A recent NASA announcement stated that the experiment failed after four months instead of the goal of six months. Four months of zero boiloff is pretty impressive though. Not the answer you're looking for? Browse other questions tagged iss liquid-fuel thermal cryogenics methane or ask your own question.